What a dismal, gray day. In just 24 hours New York was transformed from blossoming sunshine to cold, rainy and unpleasant. So I needed a red pepper recipe to improve the status quo. Who better to spice things up than Guy Fieri? He is always “rollin’ out” smiles. 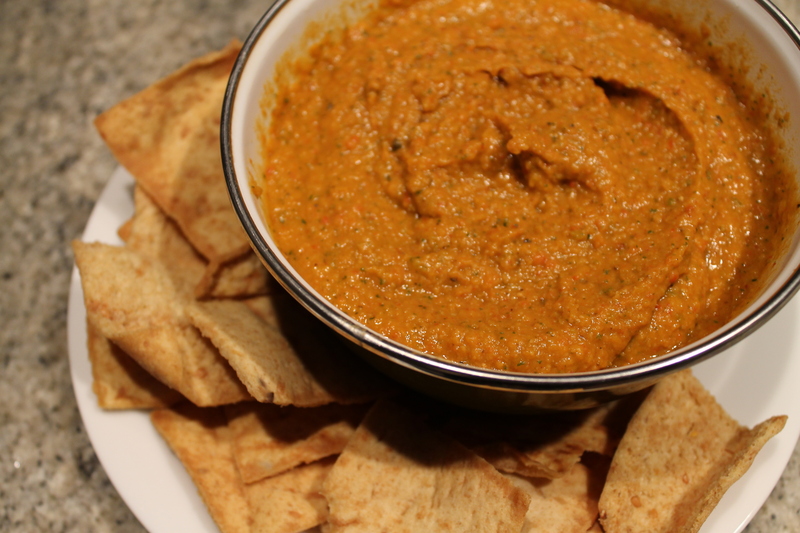 So here is my take on his Roasted Red Bell Pepper Hummus. Step 1: roast the red pepper. Slice the pepper into eighths, removing the seeds and innards. Put the pepper pieces on a small sheet pan skin side up, drizzle with olive oil and season with salt and pepper. Roast the pepper for 20 minutes. 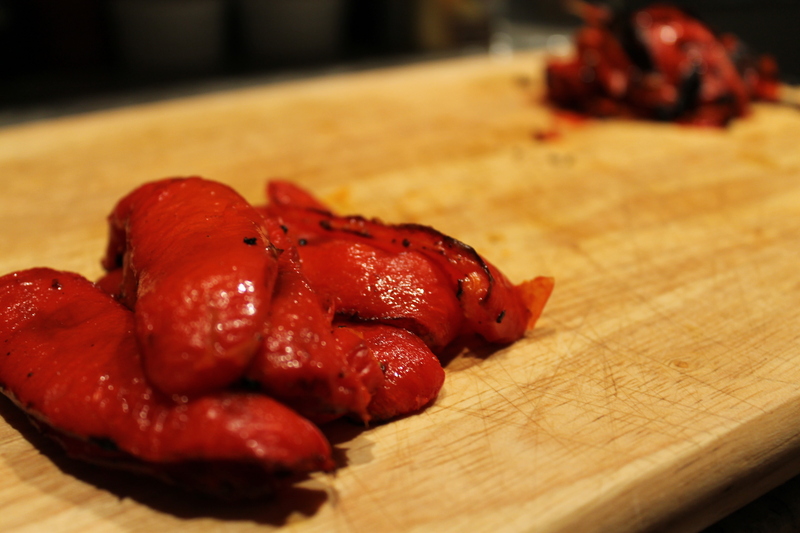 Put the roasted pepper immediately into a bowl, cover with plastic wrap, and let it steam for 30 minutes. After the pepper steams, remove the outer layer of skin, it should be fairly easy to take off. 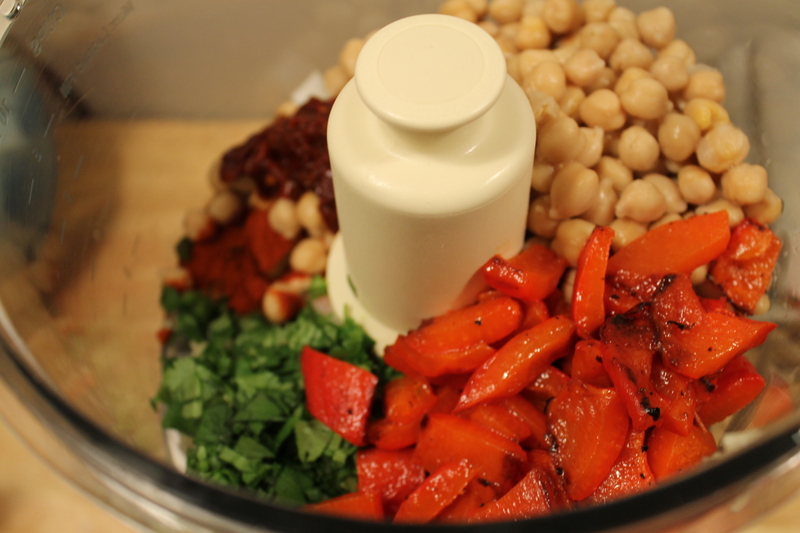 Put all ingredients (aside from the olive oil, salt and pita chips) into the bowl of a food processor. Process until pureed, then with the processor running pour the olive oil down the feed tube until combined. Season with salt and serve with pita chips! The flavor definitely improves after a day or so, so you have something to look forward to! Yum. This entry was posted in Bell Peppers, Garlic, Onions. Bookmark the permalink. Looks good! I think I’ll try it with tahini to give it a more traditional flavor.